I bought this storage cabinet for organizing my garage. This was delivered on time and was surprised to see how well it was made. It didn't take too long for assembling the storage and it works perfectly. After doing extensive research I went with this brand as it's way better than other similar product in big box stores. Add extra storage space to any room in your home with the Avenue Greene Baldwin 24 inch Storage Cabinet. The interior of this Cabinet features 5 shelves. Three of the shelves are adjustable so that you can space them to meet your storage needs. This customization allows you to store both large and small items. The 24 inch Storage Cabinet features a crisp white finish that creates a refined, clean look in your home. Use this piece as a stand-alone item, or combine it with additional Avenue Greene Baldwin storage items to create the perfect storage solution for your home. 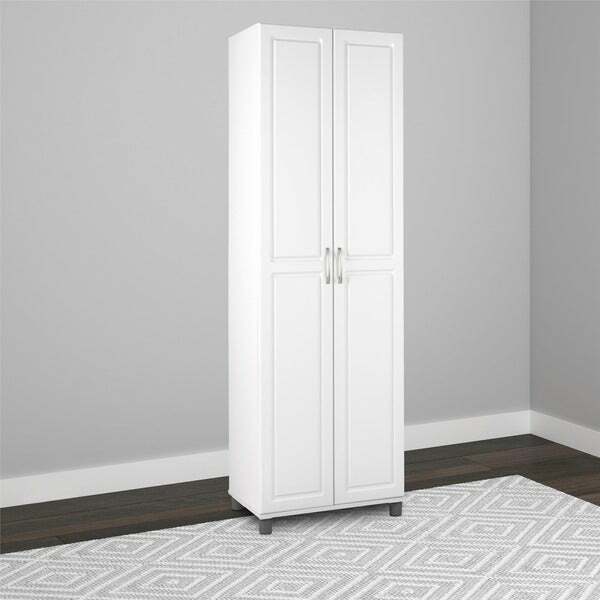 Avenue Greene 24 inch Storage Cabinet requires assembly upon delivery. Looked long and hard for a pantry that would actually not fall over or apart! It was't easy but this one by all accounts seemed to be worth a try. I took no chances and had a contractor friend put it together and it did take him a good hour. It had decent instructions but the back is flimsy as most are and you need to handle it with care.That being said , it looks good! The hinges are excellent with memory closures and the doors actually look well made. Love the rubber legs that keep the unit off the floor..My annoyance was that they don't include an extra shelf or two.The top shelf is stationary and there are four others but there is so much space between each shelf that is wasted . I ended up dividing one shelf by adding another since there are rows of holes pre-drilled so you can space the shelves in different widths. This Altra System is definitely the best of the lot.The quality is superior to any for sale in The big box stores.BTW, we anchored it to the wall as there is a metal clip..so no danger of it falling over as one reviewer experienced. Very pleased! I took a chance on this piece after reading the reviews compared to other similar cabinets on Overstock. Everyone was right! Assembly was easy and with another person took no longer than one hour. This cabinet serves as our "pantry" in a kitchen with little space. It is sturdy, attractive looking, and stable. Very, very roomy compartments! My favorite part is the quiet, a slow spring allowing the doors to shut on their own. Literally perfect for any room in the house. We want one for our laundry room. You can't go wrong here! This looks really great. It is almost perfect. The only thing is that the doors are a little bit crooked, by maybe half an inch. The holes are not aligned just right so when the doors are closed one is just a half inch higher than the other. It is in the kitchen so I don't really notice it but for the price I do wish that it had come out even. The directions for putting it together were really easy to understand and use. We purchased six of these vertical cabinets and two of the drawer cabinets for our son's room. Now all of his toys are out of sight! Also, these cabinets don't scratch like wood furniture. Some of the laminates were damaged so we pulled parts from the undamaged boxes which resulted in our inability to assemble one of the six vertical cabinets. We called Ameriwood. A nice customer service rep. put in a request to replace my parts. Most items arrived in good condition. However, I received a panel damaged and an incorrect panel. On the third try, I received the correct, undamaged panel. When assembling your cabinets, it very important to remember to measure diagonally from one right angle to the other before hammering the back panel. This will help your cabinet align properly. Bottom line! Would I purchase the cabinets again? Yes. Overall, I like the cabinets. The warehouse messed up, but customer service was great. The cabinet is great! It's being used as extra pantry storage, providing a great deal of space! It was easy to assemble. It's a great, quality cabinet , highly recommended. The one bad thing about downsizing to a smaller home was there was no pantry. Bu storage cabinets with my savior. I purchased two of them and I couldn't be happier. The quality of these cabinets are wonderful and my favorite feature is the slow close door. I highly recommend this cabinet. Worth every penny and then some. One of the best purchases I ever made!! I only have one pantry in my kitchen. I bought two and they fit perfectly, one on each side of the kitchen. They keep, party/special dinner service for 12, the food processor, baking sheets, stand mixer, hand mixer, turkey roasting pan, placemats, platters, cake stand, etc. out of sight behind closed doors and most importantly, organized!! Three of the shelves are adjustable. I have a lot more stored in them, too many items to list, all organized!! This was a two door cabinet I put together without any help. All the pieces were there. No damage to any of the pieces. Everything went together with no problems. Instructions were easy to follow. I am using it to store my linens and it is working out great. Using it for linens. I liked this so much, I ordered another. Holds a lot too. It wasn't that hard to put together despite the complicated instructions. Put the feet on first and put the bottom aside. Then work from the top down. Tip...put the hinges on then attach the door part of the hinge. Goes on easier. The wood (or cardboard) was very low quality. It was extremely difficult to put together. The one thing about the specs that was spot on is that the hinges are great. If the entire cabinet was constructed of the quality material of the hinges, I would be very satisfied. Also the doors do not meet when closed. There is a gap. Looks nice. Easy to build. 2 people needed to install doors. It's very roomy. Sturdy and very HEAVY!! Took a couple hours to put together but it really stores a LOT, heavy duty shelves can take a lot of weight - we are very happy with the purchase! Love this cabinet. I had been eyeing it for a while and am so glad with my purchase! Lots of storage for a space that was pretty useless until I got it! The screws on the hendges don’t fit. I will have to return after trying to go to the hardware store to find pieces that work. This cabinet has proved to be useful in many ways. It has seen my son's room, then the garage and now the pantry. This is much nicer looking than the typical build yourself white cabinet. It has plenty of shelving and fits nicely into a narrower space. We downsized from a large home to a condo and my second floor has no linen closet and is also where my laundry area is. I purchased two of these cabinets and placed them side-by-side and now I have more than enough storage space for linens, towels, and laundry supplies. These are heavy cabinets but sturdy. Took a few tries to adjust the doors even, but not difficult. "Do you have to use the floor leveling feet or can you leave them off." The use of the feed is recommended for best results. "Is the back of the cabinet made of cardboard?" The back of the cabinet is made of particle board. "Is it possible to get a sample piece of the door? I want to see if it matches our cabinets enough to make a pantry on an adjacent wall. I also want to make sure it doesn't have that plastic-fake look that so many of these cabinets do." It is a very nice cabinet no fake plastic to this.No plastic at all. "Can I run a lock through the handles? I need for a 4 foot keyboard to stand on end. Can I do this or will a shelf impede this?" "What are the inside dimensions of the shelves? " "Wish this was available in other color options like medium gray or navy blue. Can this be easily painted?" The storage unit is not available in other colors. While you are welcome to paint this unit, we do not recommend altering the product as it will deem it unreturnable.